At the occasion of the high-level conference on “investment in agriculture, growth and jobs” held under the auspices of the media group Euractiv, CEETTAR proposed improvements to the CAP measures to foster the contribution of the CAP to growth and job creation in agriculture. Following this evaluation, on which all the panelists could only but agree, Eric Drésin, Director of CEETTAR, suggested the Commission to adapt its vision of farming: during the last fifty years, the agricultural world has been fully transformed. If it wants to support growth and jobs in this industry, the CAP can no longer limit itself to defining agriculture as being the exclusive domain of the farmer. The agricultural contractors, who carry about 60% of farming in Europe, strongly contribute to the competitiveness and sustainability of the European agriculture, and participate in the debt relief of farmers, by providing highly technical equipment and qualified personnel. Innovation in farming is developing at a high-speed pace: smart farming, embarked technology, drones, big data are topical issues at the moment. But these technologies have a price. Supporting farmers to invest in machinery is expensive for the EU budget, distort competition between farmers themselves and far less efficient than supporting sustainable and efficient agricultural production methods. Up to the farmers to use this support to invest in machinery or to call a contractor to do the job and focus on its core business: “outsourcing a part of the work, and especially the heavy investments in machinery, allows farmers to reduce their indebtedness and to overcome difficulties due to price volatility”, Eric Drésin said. He added “the Commission should pay a greater look at the GLAS Scheme set-up in Ireland under CAP 2014-2020. In GLAS Scheme, farmers can a support for low-emission slurry spreading techniques: they can decide to outsource the work to a contractor using these techniques or go to their bank managers. The result is clear: the GLAS scheme drives huge increase in use of trailing shoe for slurry spreading which is positive for the environmental and grass utilization perspective. The EU budget also is saving expenses for redundant machinery bought by farmers. There is a firm belief in the potential of the agri-food sector in the future. The contractors share this opinion and are ready to further develop their contribution for a sustainable, future-proof and modern agriculture that creates growth and jobs. 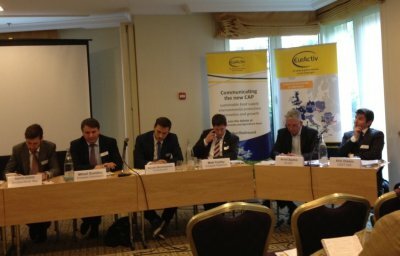 Euractiv Conference "Investment in agriculture, growth and jobs: what role for the CAP?"